The SB12 is a Clear PVC Sign Base For Holding and Displaying Small Signs. Our Clear PVC Sign Bases are Made From Pliable Rigid PVC Material with Teeth Grippers to Hold Your Insert in Place. 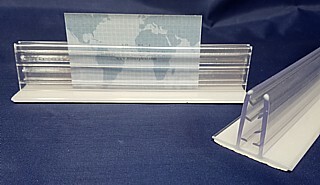 2-Sided Adhesive Tape is Applied to the Bottom For Added Stability.